The Buried Giant (2015), by Kazuo Ishiguro. My early experience reading Ishiguro lead me to believe he is nothing if not careful. After listening to him talk about the craft of writing, and his process in particular, last weekend, I fully stand by this belief. Therefore, I went back to look again at the placement of male and female characters in The Buried Giant, trusting that each character has been put there with thoughtful intention. It is a quiet book, even in its most dramatic moments, a meditation on relationships and memory. I began to imagine the characters in the book represented in a triptych, with each wing its own set of panels, arranged to support contemplation: In the central panel, Beatrice leads Axl, with their son painted in colors which render him almost invisible. On the left wing, three panels depict the other women in the novel, and on the right, Axl is echoed in a trio of men. 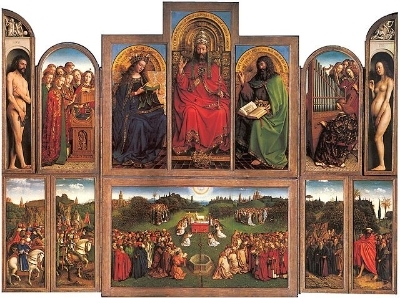 Jan van Eyck, Ghent Altarpiece (1430-1432). An excellent example of a complex polyptych, a triptych of many-paneled wings. The three most prominent women to figure in the supporting action we see through the eyes of the Saxon boy Edwin. First is a maiden, bound by three male companions and abandoned in the rushes by the river. She initially refuses Edwin’s offer of help, but then accepts it and weeps. The second is Edwin’s mother, who has also been taken by traveling men. The dragon takes up her voice, calling to Edwin to free her. The dragon Querig is the third, an aging beast, who was taken and bound by a group of Arthur’s knights. The men co-opted her magic breath to enforce a strange peace on the land. A chorus of crones complete the depiction of women in The Buried Giant: the widow harassing the boatman, and her sisters hurling abuse at Gawain, all for depriving them of the memories of their husbands, separating them from even the memory of love. On the other wing are three men, all cast in their relationship to courage in battle. Edwin is the youth, almost a man, ashamed at running from a fight. Wistan is the warrior in full flower of strength, on a mission of vengeance for the wrongs against the Saxons, but with conflicted feelings towards to the kindly old Briton couple. Britons raised Wistan; many were individually kind to him. Yet the Britons and Saxons slaughtered each other. It is his duty to remember that, right? The third on the men’s side is Sir Gawain. He appears to act the sage, yet is full of half-truths, defending his actions with the question, “if you were there, would you not have done the same?” The placement of supporting male and female characters in the book echo and expand the relationship between Beatrice and Axl through every age of man and in ever widening circles.